Add breathtaking accent pieces to your bedding with our Rustica Portugal - Soft Denim Stone Washed Standard Sham - Gray. Add breathtaking accent pieces to your bedding with our Rustica Portugal - Soft Denim Stone Washed Standard Sham - Taupe. 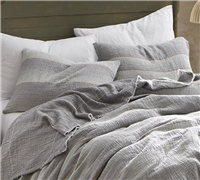 Add breathtaking accent pieces to your bedding with our Rustica Portugal - Soft Denim Stone Washed King Sham - Gray. 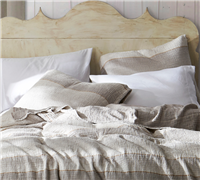 Add breathtaking accent pieces to your bedding with our Rustica Portugal - Soft Denim Stone Washed King Sham - Taupe. Add breathtaking accent pieces to your bedding with our 200TC Saudade Portugal Standard Pillowcase - Washed Percale (2-Pack). Add breathtaking accent pieces to your bedding with our Violeta Folho - 300TC Sateen Stone Wash Standard Sham. Add breathtaking accent pieces to your bedding with our Violeta Folho - 300TC Sateen Stone Wash King Sham. 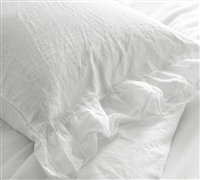 Add breathtaking accent pieces to your bedding with our 200TC Saudade Portugal King Pillowcase - Washed Percale (2-Pack). Add breathtaking accent pieces to your bedding with our 300TC Violeta Folho Portugal Standard Pillowcases - Stone Washed Sateen (2-Pack). Add breathtaking accent pieces to your bedding with our Rendas Estilo - 200TC Percale Stone Wash Standard Sham. Add breathtaking accent pieces to your bedding with our Bom Dia - 300TC Washed Sateen Standard Sham. Add breathtaking accent pieces to your bedding with our Bom Dia - 300TC Washed Sateen King Sham. Add breathtaking accent pieces to your bedding with our 300TC Bom Dia Portugal Standard Pillowcase - Washed Sateen (2-Pack). Add breathtaking accent pieces to your bedding with our 300TC Violeta Folho Portugal King Pillowcases - Stone Washed Sateen (2-Pack). Add breathtaking accent pieces to your bedding with our Rendas Estilo - 200TC Percale Stone Wash King Sham. Add breathtaking accent pieces to your bedding with our Leixoes Textura - 200TC Percale Stone Wash Standard Sham. Add breathtaking accent pieces to your bedding with our 300TC Bom Dia Portugal King Pillowcase - Washed Sateen (2-Pack). Add breathtaking accent pieces to your bedding with our Boa Noite - 200TC Washed Percale Standard Sham. Add breathtaking accent pieces to your bedding with our Boa Noite - 200TC Washed Percale King Sham.